This Sunday double treat for cricket fans. First match is done. Here’s the second match of the day. Mumbai Indians will take on Kings Xi Punjab. Both the teams lost their first game so they work hard for their first win. Both the teams have heavy batting line up. This is the clash between undoubtedly equal sides. It’s going to be raining runs in Mumbai. Here’s the preview and live scores, live streaming of the match. The runners-up of IPL 2014 Kings Xi Punjab couldn’t fired up against the Rajasthan Royals. Their strategy of changing batting order back fires them. They have the perfect XI and they will play with same side in this match too. Fans expects Virender Sehwag who missed out in the first match with golden duck, will bring his best at the top order. Impressive young fast bowlers helps big time for them. Mitchell Johnson will be a dangerous bowler at any point of the game. Mumbai Indians always one of the favorite side in the IPL. Rohit Sharma, the skipper plays a magnificent game against Kolkata knight riders. He scores unbeaten 98 from 65 balls. Corey Anderson contribute with half century and take wicket in the very first over. Mumbai bowlers couldn’t able to pick wickets in that match that causes 7 wicket lose in their opener game. Live Streaming : Sony six (English), Sony Kix (Tamil), HotStar application. Mumbai’s strategy of open the innings with Rohit Sharma works really well for them. Aditya Tare may be pushed to no.6 in this match and Corey Anderson and Kieron Pollard may plays at no.4 and no.5 respectively. Opener Aaron Finch doesn’t impress in the first game but he may get another chance. Lendl Simmons may have to wait some more matches. Skipper Rohit Sharma definitely the key player for them. Kings Xi Punjab expected to play with the same side. They may play Glenn Maxwell at no.4, David Miller at No.6 and George Baily at no.6. Mitchell Johnson may start his attack after the 10th over. Mumbai is a bets place to bat first so won the toss and elect bat first is a right choice. Its Clash of Titans today. This sunday night will be a blaster for cricket fans. 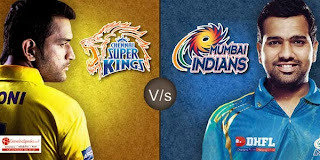 Here's the Mumbai Indians vs Kings XI Punjab live score and live streaming for you. Stay tune with us for all IPL actions.